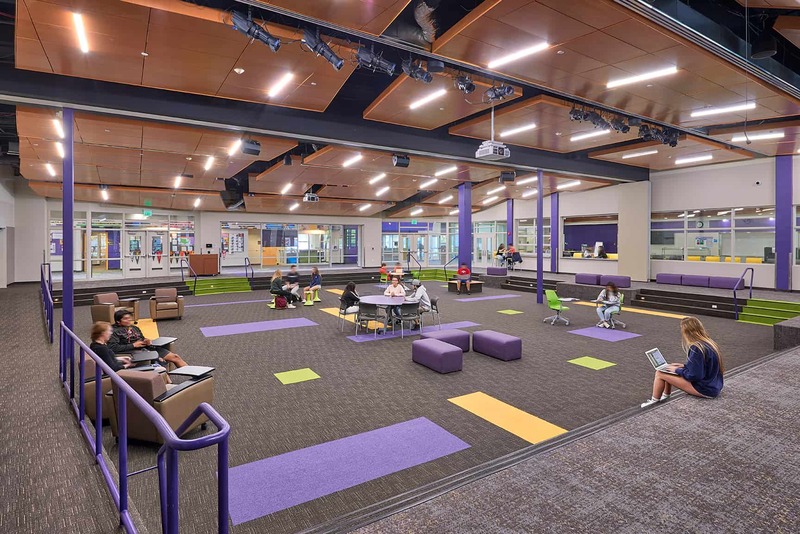 Congratulations to Basalt High School, recipient of the 2018 Association for Learning Environments (A4LE) Summit Merit Award for Renovations! Basalt High School in the Roaring Fork Valley of Colorado’s ski country had both an opportunity and a dilemma. On one hand, a desire by the local arts community and educators to support growing music, drama and theatrical programs, but a structure, built in 1975 without the facilities to support it. As part of the Roaring Fork RE-1 School District’s master plan to improve and update Basalt schools, the high school underwent construction in 2017-2018. A flexible, multipurpose performance/commons space was added for student and community use, as well as a vocal and instrumental music classroom. D.L. Adams Associates brought 40 years of acoustic, and theatre consulting to the project to help create efficient, flexible use spaces with rigging, performance lighting, and theatrical components for drama, acoustically sound music practice rooms, as well as audio video infrastructure to support presentations and community events. Students, faculty, and the growing arts community are all benefitting from this new addition to the city of Basalt. See the full list of 2018 A4LE award winners here.